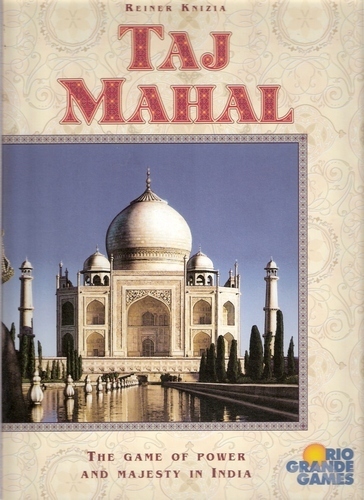 About 10 years ago, I could honestly say that Reiner Knizia's classic Euro Taj Mahal was my absolute favourite game. It had everything I wanted - simple tough choices, fascinating and highly unique game play, and multiple paths to victory. If you haven't tried it, you really should - it's a fascinating card/board game of chicken and bluff that rivals anything put out today. Unfortunately, after an uncountable number of games, it became obvious that an experienced player could win over newbies every time by simply taking all the elephant cards and winning the elephant tile most rounds. Frustratingly, this became something that always needed to be explained every time new people played and the game lost a little bit of its sheen. Fast-forward to this summer and we've played a bunch of games of Hawaii, a fantastic Euro with a bit more depth than Taj Mahal. Unfortunately, in the last couple games one player has decided to try the 'red price token' strategy. If you aren't familiar with Hawaii, almost every turn you grab a price token and a whole bunch of them are red. One can purchase tiles in the game which award bonus points every time a player takes a red price token and these bonuses are most certainly cumulative. By the end of my last game, my parter was earning 7 points every time he grabbed a red price token and he ended up winning handily. The gap in the previous game was even wider. Sigh. Of course, this is manageable if all the players are onboard. Much like how everyone can't let one player grab the elephant tile every time in Taj, the players can't let one player grab red price token tiles every round in Hawaii. I suppose it isn't broken, but the last thing I wanna do in a game like Hawaii (where turns are intentionally very limited) is waste a turn blocking an opponent's play. It's like wasting trains in Ticket To Ride to block someone's route. I hate that. I'm not sure if I understand this right Eric, but you only advance 1 or 2 points every time you grab a red token, according to the explanation of the (spear) hut rule, so how could your partner score 7 points? The Princes of Florence has a similar "problem" with the power of the Jesters. Since it's not immediately obvious to new players, explaining their power and what a reasonable auction price for them would be is pretty much required when teaching the game. But I don't really know whether this is an actual "flaw" in the game or not. With players of the same skill/experience, it's not a problem. And if you just clue in new players, it's not a problem. So really, it's more just a matter of some asymmetry built into the system of the game that you have to account for, which actually makes it more interesting. Well, if you put a spear hut in each of your villages, I think they are cumulative, aren't they? If you can get three or 4 of them, it makes for a huge score. If they're aren't cumulative then all is well. And yes, Chris, the Jesters in POF are powerful and I do mention them although I don't think I've seen someone play an all-Jester game before. Usually everyone automatically fights over them. I love POF. 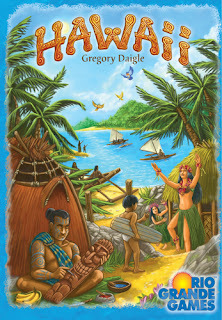 Yeah, I just double-checked the rules - the effects of spear huts are definitely additive so in theary a player could earn up to 10 points for each spear token if they played it right. Yikes! Yes you are right on this Eric, I didn't know that there were multiple huts involved. But I haven't encountered this yet in my plays. I will try to follow this 'strategy' next time and see if you are right about this. Looking at this like blocking the 'red tile' or 'elephant' might be framing the point unfairly. Could it not just be that they are an important part of any strategy? Ie you should plan to grab some number of red tiles or elephants regardless of what your main strategy is. This maybe a measure intended to make scarce actions even scarcer which keeps the difficulty up, and ensures no one can get a run away game. I should play these both before saying too much more. 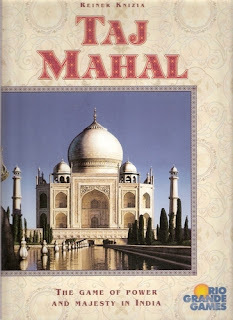 It has been a long time since I played Taj.